In this video, I show you one of my favourite program building time savers for online personal training program design. How to copy workouts and sections of your workouts inside the PT Distinction program builder. For copy and paste, I prefer the second view of the Program Builder because it lets you see multiple workouts on the same screen at the same time. So just click to change view. To copy a workout, come up to the title with the workout's name, click on the three dots, and select copy workout. 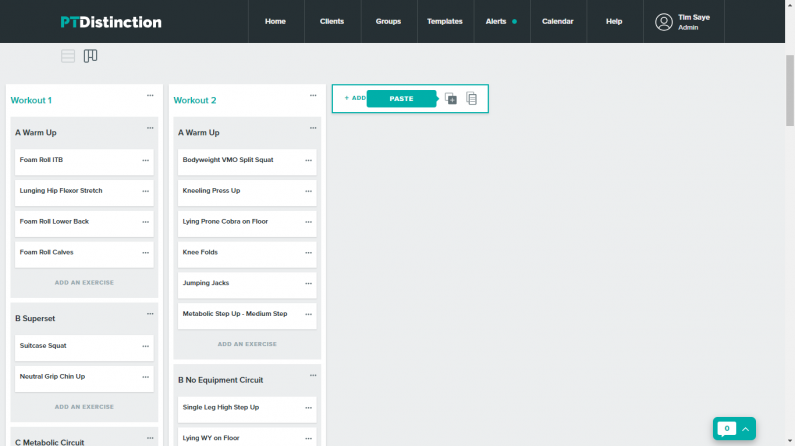 It let's you know that your workout's been copied to your clipboard. To paste your workout go to where it says add a workout and click on the plus icon for paste. This brings up your clipboard, which stores up to 10 different workouts. Your most recent one will be at the top, so click on that and click on add workout. You'll see that it is now pasted into your program. To copy a section of a workout, for example, your warm up, a superset, or a circuit, come up to the title of the section, click on the three dots next to that, and click on copy section. To paste the section, click on add workout so that you've got another workout to copy to. Underneath the section name, just click on the paste button. Once again, you've got 10 different sections of workouts stored in your clipboard, and the most recent one will be at the top, so click on that one, and add section. You'll see that your warm up has now been copied across. This option gives you a lot more flexibility when copy and pasting in to your programs..
You can do the same thing with your templates. To paste in a workout from your templates come over to add workout and click on the templates icon, from here you can choose workouts from your templates. To add a section from your templates click the templates icon next to where it says add section. This a very flexible system that allows you to take little bits of your workouts, or entire workouts, and copy and paste them very quickly from across your templates, programs, or the current program that you're working on. You can later move exercises around, take them away, add in new ones, or edit any of the variables that you wish to for any of the workouts that you've got. So not only does it save you a tonne of time, everything is completely customisable for every client. To build your clients training programs in less time than you ever thought possible join PT Distinction, free for the next month.